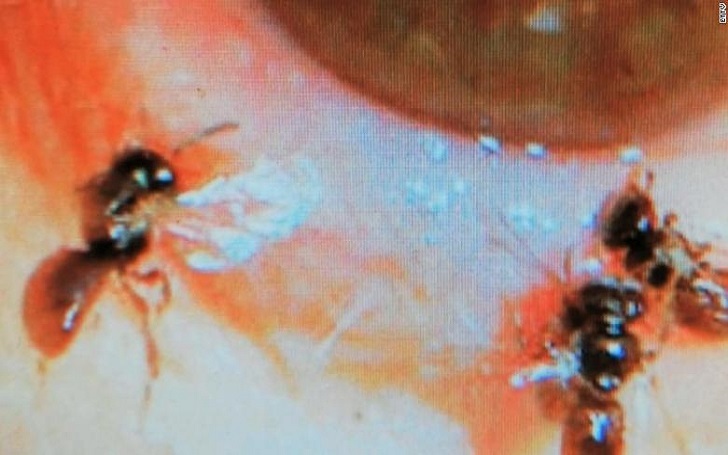 Four sweat bees were found living under the left eyelid of a Taiwanese woman who was treated by doctors for her swollen eye at Taiwan's Fooyin University Hospital. According to CNN affiliate CTS, the minuscule insects were are 3 to 4 millimeters in length. I saw something that looked like insect legs, so I pulled them out under a microscope slowly, and one at a time without damaging things inside. The doctor said that sweat bees aka Halictidae, "nest near graves and in fallen trees, so it's easy to come across them while hiking in mountains." The woman said she thinks the insects blew into her eye when she was at the gravesite of a relative. She washed her eyes but still had been experiencing severe pain. She said, "It was very painful. Tears wouldn't stop coming out of my eye. I was scared to death." After three hours of pain, she visited the hospital, where doctors told her that she was suffering from cellulitis and a bacterial skin infection. It was later found that she was suffering from severe corneal erosion caused by the sweat bees. Hung said, "Thankfully she came to the hospital early, otherwise I might have had to take her eyeball out to save her life." As per the report, she eyesight had been reduced to under 0.1, the equivalent of 20-200 vision on the Snellen eye chart measuring visual acuity, Hung told reporters. The doctor said, "Luckily, she didn't have a high fever and it hadn't affected her central nervous system."